Our busy lives, often make us dependent on the microwave oven to quickly cook meals and reheat food for our families. 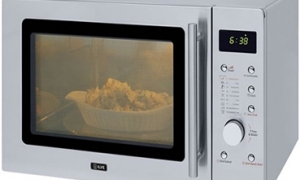 The convenience of the microwave oven provides an easy solution to the problem of tight schedules, but the convenience should not allow us to take safety for granted. Scalds are the leading cause of injury from microwaves, but fires can ignite too and make an easy meal a dangerous one. You can prevent harmful burns and potential fires by following these safety tips. Register your microwave either online or with the provided card. This allows the manufacturer to contact you about recalls or potential dangers. Be sure that your microwave is installed properly, especially if it is over the range, and is at a safe height for all users. Plug the unit directly into the wall outlet. DO NOT use an extension cord. Only use containers that are microwave safe. Never heat sealed containers. Leave an opening for steam release. 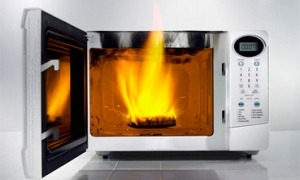 Never put metal, like aluminum foil in the microwave. Since a microwave heats food unevenly, never heat a baby bottle in the microwave. Supervise children when they are using the microwave. Do not overheat water in the microwave. Superheated water can erupt and cause scalds. Open food slowly and away from your face. Steam can cause burns. 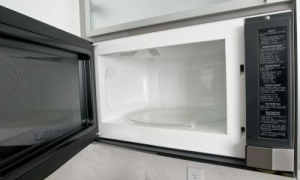 Since food is heated unevenly in the microwave, you need to stir the food before testing the temperature. Turn the microwave off and unplug it.